Saturday February 18 we will be launching our Anti Dog Fouling/Green Dog Walkers Campaign. You can become involved by visiting one of our stands from 10.30. South Beach by Playground…Entrance to St Crispins…Greystones Marina…Burnaby Park..
Cliff Walk…Burnaby Heights Estate…Burnaby Lawns. The Green Dog Walker scheme is a positive and pro-active way to encourage and support responsible dog ownership. It aims to increase awareness of the problem of dog fouling which is among the most common forms of littering. Green Dog Walkers will receive a complimentary Green Dog-Walkers high-vis vest, Green Dog-Walkers armband and a ‘doggie bone’ poop-bag dispenser with a roll of bags. 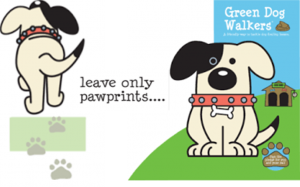 By becoming a Green Dog Walker you have ‘Taken the Pledge’ to always clean up after your dog, to carry extra doggie bags and to gladly give others a bag for their dog if they ask for one. By wearing the green armband you are indicating that you are a responsible dog–owner participating in and supporting the scheme. Presentation on how to cut down on your waste. May 19th @ 7.30 pm.Greystones Library. Tried to register. as a responsible dog walker this morning at the south beach playground but failed. Drove down from Kilcoole area in order to do so but could not find anyone to register with. Think it is a great idea as am fed up with dog fouling and irresponsible dog owners give all of us responsible ones a bad name. I’m so sorry I missed this on Saturday, it’s a brilliant campaign and public awareness is paramount. Is there any chance of getting any of those goodies ? I am very happy to join this campaign since we have adopted a rescue puppy in the past few months. Dog poo is such a blight on our streets. Last Saturday in Greystones, Tidy Towns launched an anti-dog fouling campaign called Green Dog Walkers. The aim is to make people conscious of the fact that it is not ok to allow dogs to foul nor is it ok to hang dog litter bags on railings, shrubs etc.